We just returned home from a trip to northern California. Thirty years of marriage is reason to celebrate so we put our heads together and planned a fabulous trip. I hope you don't mind if I share a little. 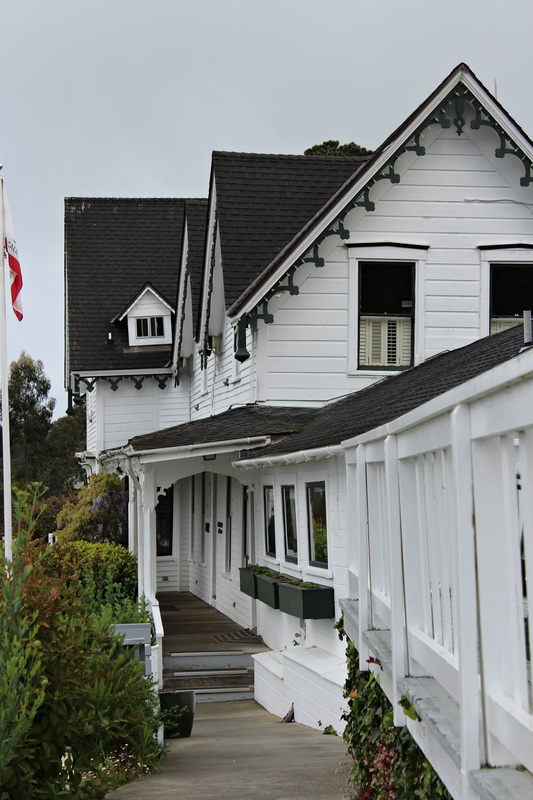 The first day and a half of our California adventure was spent at The Little River Inn in Mendocino, California. This old white clapboard building is dreamlike! It is set right on the water and we had amazing views from our room. We had a woodburning fireplace and chairs perfectly positioned to enjoy the crashing waves. While we were there, the weather was overcast and cool. Just before leaving Texas we threw extra jackets in our suitcases and ended up wearing them the whole trip! Thank goodness for that last minute decision. We hiked all along these rocks observing the birds and plants. They say that certain times of the year you see whales migrating through here but we didn't get that lucky on this trip. The water is the most beautiful, clear blue. We spoke with very nice locals and visitors from around the world. 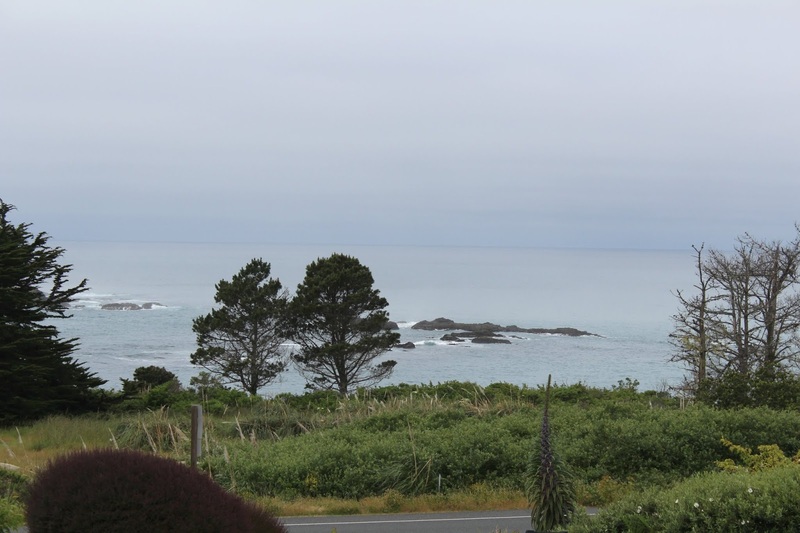 We had read that Mendocino is typically not overly crowded and we found that to be true. The Little River Inn has an amazing restaurant and bar on the property. We had our dinner in the bar because we loved the atmosphere. The food was delicious! Just up the road, we hiked to the Point Cabrillo Light Station. This was such an interesting spot with a museum honoring the history of the place and the families who lived and served there in the past. The goal of our trip was to see the redwood trees (which I will share next week) and Mendocino was a stop on the road. We ended up loving it here so much that we will probably go back and spend a few days in this little village. 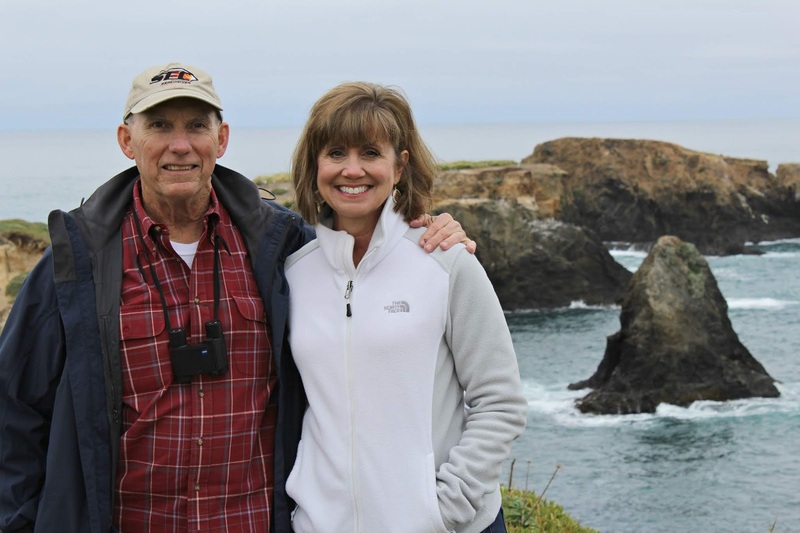 Have you visited northern California? That looks like such a charming place to stay! I have been to Napa and Sonoma. In fact we are thinking about going back there for our 40th anniversary next year! How beautiful! I have been to Southern California and then San Francisco just once but I would definitely like to explore more of Northern California. Happy Anniversary! Oh Stacey... what a picturesque spot! 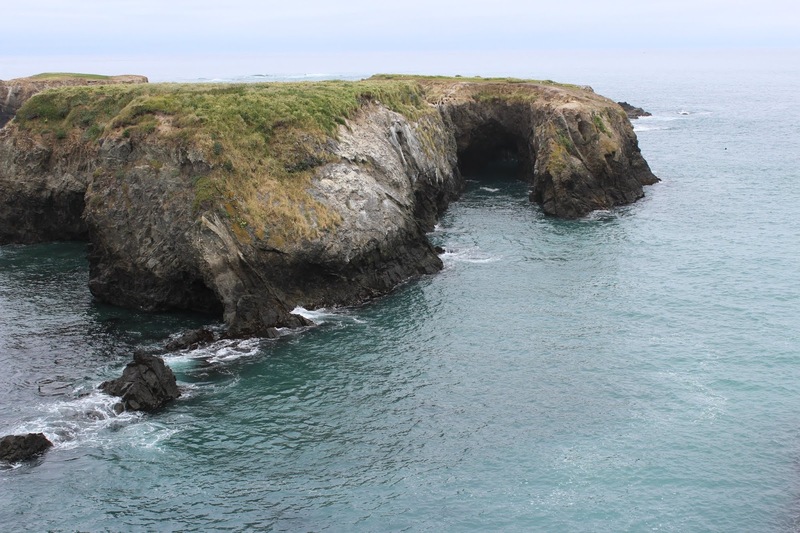 Thanks to you, I put Mendocino on my bucket list. Love your hair... btw. Happy Anniversary!! 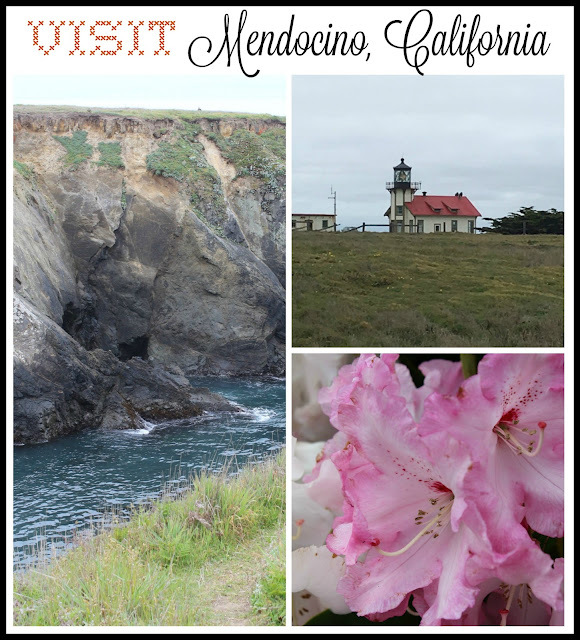 We have plans to get to Northern Cali someday and Mendocino is on the list. I may come to you for tips when we plan it. What a sweet and quaint area and you and Mr......PRECIOUS!! What a beautiful picture of the both of you. Congratulations! Looks and sounds like a wonderful place to visit. How gorgeous! Those Cali rock beaches are so very special. Years ago, Maurie had clients in San Francisco and we would go every August to relish the cool weather! 45 degrees in the morning, yes please :) I just can't wait to see your photos of the Redwoods! I love northern Cali! We spent the 4th of July in San Fran once and it was freezing! I loved it! The only 4th of July in my life where I wore a coat and hat. Ha! I've been to Muir Woods and the redwoods are amazing! What a wonderful trip for y'all! Congrats on 30 years too! 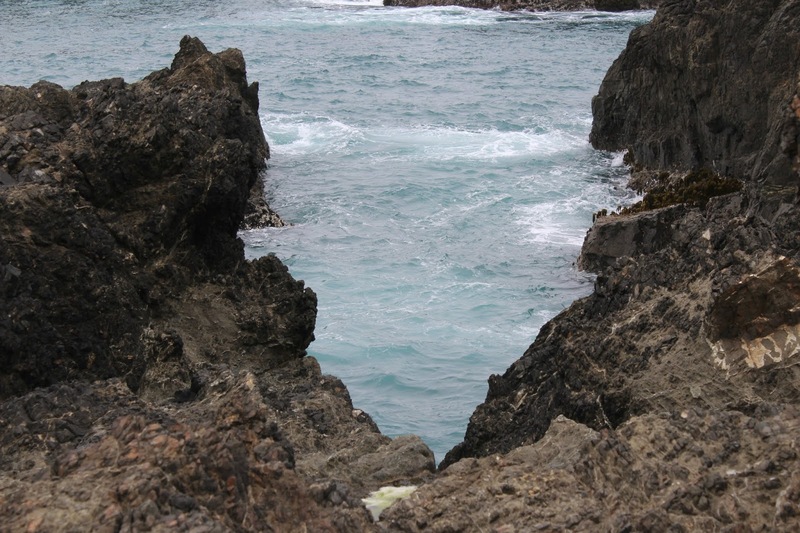 I have been to Mendocino! I love all of Northern California! My daughter and I did a tour of the Nappa Valley a few years ago. SO beautiful. But I shall never forget Mendocino. That's where my daughter, Amber, was conceived. We stayed in a lovely inn and could hear the waves crashing and the sounds of the horses hooves as they were running out to and along the beach. Congratulations on such a wonderful trip and your beautiful life together!! What a heavenly place for an anniversary trip. That photo is wonderful of both of you. I've visited Northern California but not Mendecino and not for ages. It looks like a perfect holiday. Stacey, Happy 30th Anniversary! Your stay in Mendocino looked perfect!, Northern California is so beautiful! Happy 30th Stacey. I can't wait to hear more about your trip. I love being able to slip off with the hubby on a trip. People who didn't make it to 30 and the kids gone make me sad, because I am finding it to be a whole lot of fun. I've not heard of that place but it looks like a great place to visit. Guess I need to put that on the bucket list. So beautiful! When we planned our March California trip, I debated between Yosemite and Redwoods/N California. I'm so glad we picked Yosemite to do with the kids, because Northern California looks like a perfect couples getaway to save for the future. Can't wait to see more! Congratulations on your 30 years and looks like a great place to visit. I have always heard that northern California is beautiful. Glad you had a great time...it is truly a most beautiful area!! That loos like a wonderful place to visit. I haven’t been to Northern California in a long time but I remember how gorgeous it was. Sounds like you had a great time Happy 30th! I am so glad you were able to get away and celebrate your 30 years of love and life in such a pretty spot! Northern California is indeed very beautiful. I'd take some of that cooler weather right about now too! I'm headed to San Francisco in a couple of days. I don't think it would have occurred to me to pack a jacket (when it's so hot here in Texas). I'm even more excited to go after looking at your beautiful photos! That does look like a charming place to stay. Looks like you really had a relaxing time. So great to read through your fun post again! Thanks for linking up to the June Take Me Away party! Enjoy your weekend!